In all the discussion this past week about the recently indicted former Trump campaign chairman, Paul Manafort, his eye-popping consumption patterns and where he might or might not have shopped and why, there was one public reaction that struck me the most. It was not concern about where Mr. Manafort got all that money, or anger about the fact he spent all that money on stuff — including, according to the Justice Department, more than $1.3 million on clothes — but rather surprise about the fact he spent all that money on stuff and didn’t even look that good afterward. And that reveals as much about us and our own expectations and assumptions as it does about the subject at hand. It’s as though Mr. Manafort potentially cheated not only the I.R.S. but also our own fantasies of how we would live if we had access to the same kind of ill-gotten gains and “lavish lifestyle.” This would, presumably, be something along the lines of the James Bond-Gianni Agnelli model, in clothes that no one can really identify, except they fit so seamlessly and look so ineffably better than everything else that they bestow an aura of connoisseurship on all they touch. 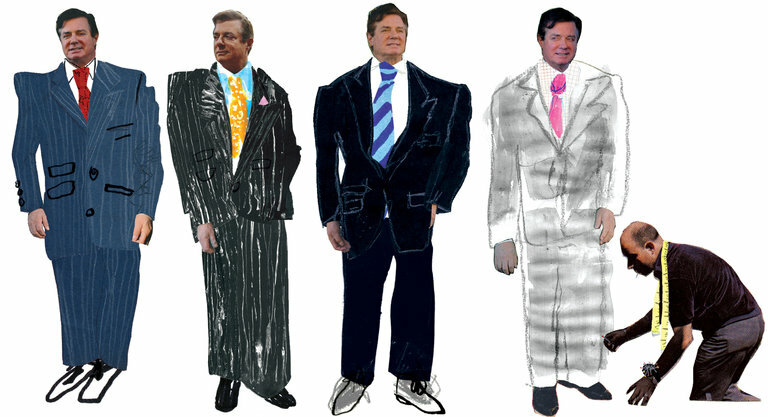 But instead of that, Mr. Manafort gave us, at least according to The Associated Press, House of Bijan, a Rodeo Drive men’s wear store where he may have spent $520,440 between 2008 and 2012. And according to the shoe designer Tamara Mellon, when she asked her partner, Michael Ovitz, the former superagent and head of the agency CAA, who shopped at House of Bijan (“no one I know,” she had said), he told her that the only man in Hollywood he had ever heard of before Mr. Manafort who favored the store was Aaron Spelling, the executive producer of “Dynasty,” “Melrose Place” and other kitschy fantasies of richesse. Which is to say, Mr. Manafort allegedly gave us “Money Laundering,” the prime-time soap opera. Those big, shiny, Crayola-toned ties. The thick, not entirely natural-looking hair. The custom suits that nevertheless pulled and bunched across the chest and waist, when fit is supposed to be the whole point of a custom suit. The faux idea of what a master of the universe would wear. The one that equates cost and surface with value. ← What Does Bill de Blasio Do All Day, Anyway?